Greetings and welcome to all who visit my little corner of the world. I have recently been blessed with having Dr. OZ feature my Miracle Fruit Tablets above on TV on 2/18/11. It helps us with our sweet tooth and also is a great party item. He feels it can change the way we diet. I am a garden designer by trade and specialize in herbal gardens and romantic country gardens which draw you into them. It provides a very special setting which is both beautiful and relaxing. I also sell special items which I personally use due to severe back pain. Curamin is one of these items. It truly works. As I get very chapped hands, I have been a US distributor for Egyptian Magic Cream for a long while and it is superior for moisturizing face and body. 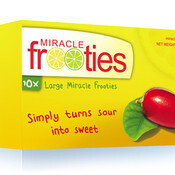 Miracle Fruit Tablets are a fantastic fun item made of a small berry (freeze-dried) which alters the taste buds for about 20-30 minutes from sour to sweet. These are great fun for parties, birthdays, family gatherings. Write to me for a list of party foods to serve with them. I just sold a bunch to NASA and the Food Channel and also to various cooking schools. Great Fun! I am always happy to answer your questions. Just write. Wishing you the very best! ladykingel doesn't have any items in their booth! What an Absolute Treasure and Delight, Lady Kingel is to everyone whose life she touches! Not only does she carry the best Creams for Beauty and Home, but she is one of the most caring, kind Sellers/People on Bonanza! An Honor to know her! Thank you! Wonderful to deal with! Great prices. Highly recommended. Reasonable price and free shipping! Her descriptions are very persuasive, for she takes or uses her products personally. Great Items . A Wonderful seller. Fast shipping.. Very Good communication. AAAAA+++++ Recommended. A Bonanza Seller with a Heart of Gold! Wonderful, fun products to offer. Highly recommended.